On February 27, Global Advantage’s President and CEO, Dave Watters attended the stakeholder “lock-up” on Parliament Hill for the official federal Budget release. The lock-up permits attendees to question Finance Canada officials about details of the Budget and gain new insights. Immediately after our office was abuzz. Adam Jarvis, Global Advantage’s Vice President of Policy and Research lead our team of research analysts in updating our well-known Canada’s Science and Technology Innovation Ecosystem Map (digital version available soon). Meanwhile Dave Watters, immersed himself in the 369 page federal Budget document to prepare for our own annual event, Global Advantage Budget Insights, held March 8 at Ottawa University’s Telfer School of Management’s new location at 99 Bank Street. A very special thanks to Bojo Vlacic for the excellent accommodations at Telfer. The Global Advantage 2018 Budget Insights was developed by Dave and Adam and focused on the Budget’s impacts on key areas of science and technology, R&D, innovation, commercialization, economic development and trade. The presentation was followed by a lively Q&A session. Attendees from both the public and private sector found the presentation to be informative, insightful and helpful. 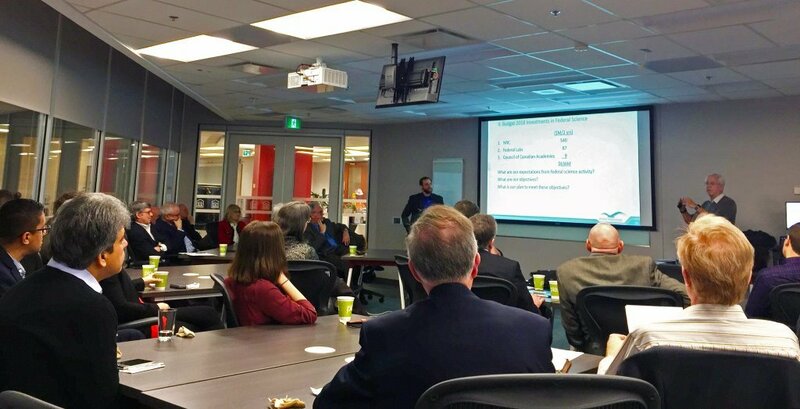 Adam and Dave also lead a tailor-made presentation for staff of Global Affairs Canada on Budget 2018, emphasizing the links between Canada’s innovation and trade agendas. How will the 2018 Budget and the Innovation and Skills Agenda affect your organization? What are the risks and opportunities? Global Advantage offers customized briefings tailored to your organization’s needs and goals to help you plan for the next fiscal year so you can be more innovative, collaborative, and results-driven. Previous PostWhat’s Happening at the Global Advantage Consulting Group?